Any of three related angles by means of which the position, at a particular time, of a body moving in an elliptical orbit can be calculated. For a body S moving around the focus, F, of an orbit (see illustration), the true anomaly is the angle v made by the body, the focus, and the point, P, of nearest approach. For a body orbiting the Sun, P is the perihelion. The angle is measured in the direction of motion of S. If an auxiliary circle is drawn centered on the midpoint, C, of the major axis of the elliptical orbit, then the eccentric anomaly is the angle E between CS′ and CP, where S′ lies on the circle and is vertically above S. The mean anomaly is the angle M between P, F, and a hypothetical body moving at a constant angular speed equal to the mean motion of S. It is thus the product of the mean motion and the time interval since S passed P.
where a is the semimajor axis of the orbit. See also equation of center; orbital elements. In celestial mechanics, the angle between the radius vector to an orbiting body from its primary (the focus of the orbital ellipse) and the line of apsides of the orbit, measured in the direction of travel, from the point of closest approach to the primary (perifocus). Also known as true anomaly. An abnormal deviation from the characteristic form of a group. A local deviation from the general geological properties of a region. Any part of the body that is abnormal in its position, form, or structure. The deviation of the value of an element (especially temperature) from its mean value over some specified interval. The difference between conditions actually observed at a serial station and those that would have existed had the water all been of a given arbitrary temperature and salinity. A deviation beyond normal variations. 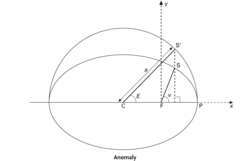 Abnormality or deviation. Pronounced "uh-nom-uh-lee," it is a favorite word among computer people when complex systems produce output that is inexplicable. See software conflict and anomaly detection.